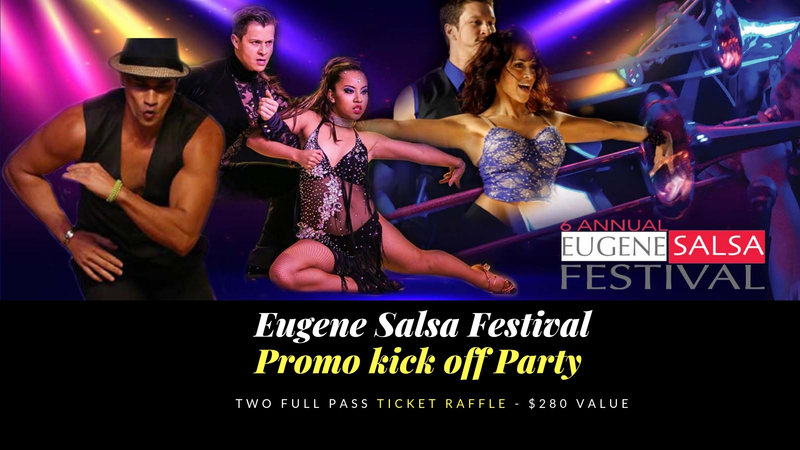 Salsa dancing in Eugene, Oregon. “The” Cuban dance party in Eugene. Through the music at our monthly dance we bring a little Cuban FUN & Flavor known as “Sabrosura”. Showcasing occasional Cuban performances, bringing renowned DJ’s and hosting Cuban artists adds to the spice. 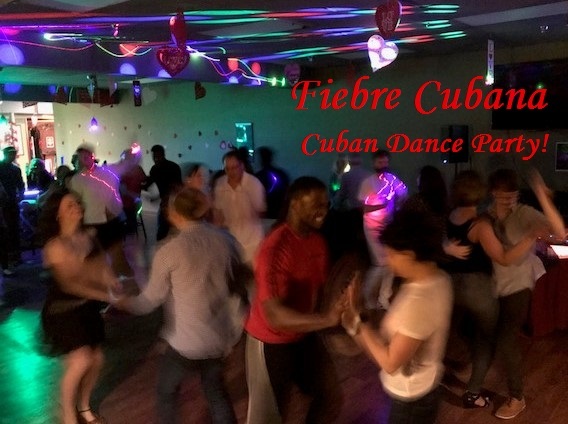 Come see what people are talking about at FIEBRE CUBANA. Located in the hottest dance club in Eugene, The Lounge, 2043 River Road 97404. Saturday December 15 – Special Edition Eugene Cuban Holiday Party ! 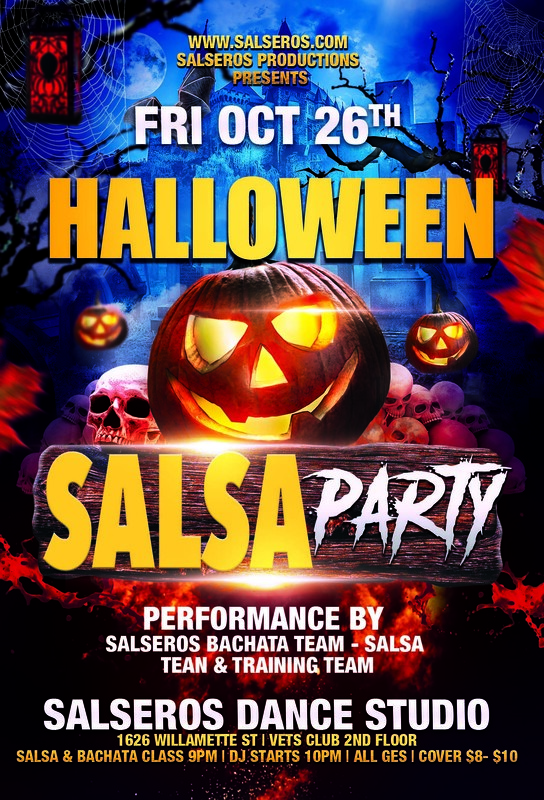 Come join us for the Halloween Salsa Costume Party at Salseros Dance Studio! DJ Jose Cruz will be playing Salsa, Bachata, Merengue, and Chacha all night, plus Special Performances by Salseros Dance Company Salsa Team, Bachata Team, and Training Team wearing their Halloween costumes! Salsa class at 9pm with Paula Tomczak Salseros Dance Company Instructor. All ages welcome, no partner, experience necessary to attend. Be fun! Wear a costume (but it’s not mandatory). $10 cover for the evening including class / $8 before 9:30pm. Class 9pm, dancing starts at 10pm. Performance at 11pm. DJ Jose Cruz will be playing the hottest Salsa Music, plus Bachata, Merengue, & Cha cha cha. Salsa & Bachata Class for Beginners taught by Michelle Cruz Salseros Dance Company Instructor. No experience or partner is necessary to attend, All ages welcome. Doors open at 8:45pm, class begins at 9pm, and dancing all night starts at 10pm. $8 Cover, Only $6 Before 9:30pm. 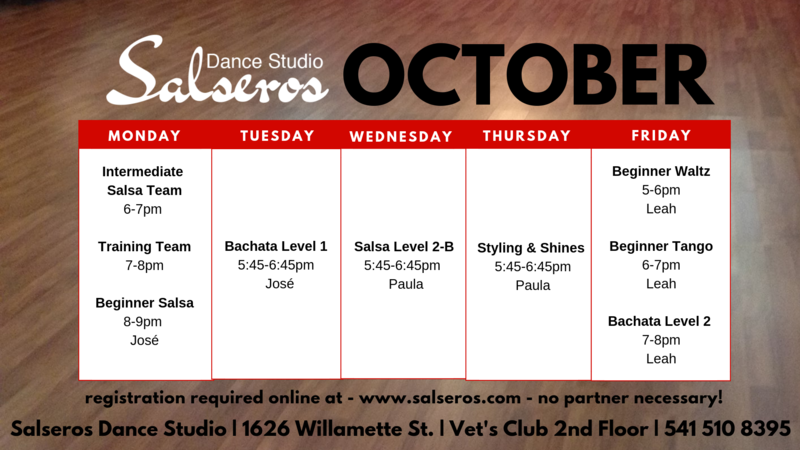 Salseros Dance Studio, located on the second floor of the Vet’s Club building at 1626 Willamette St.
Sign up for a group class! Come learn how to dance, and have fun doing it! All classes are taught by Salseros Director, José Cruz and Salseros Dance Company Instructors, Paula Tomczak and Leah Velez. You can come by yourself, with a partner, or with friends. Cost for all 4 week sessions is $45 paid in advance online; or $55 at the door. No drop-ins. You must register to attend. All Classes are held at The Salseros Dance Studio at the Vet’s Club Building upstairs, 1626 Willamette St. Eugene. Live Salsa at Salseros Dance Studio! Our very own 11 piece band from Eugene, Descarga 54, will be playing! Salsa & Bachata Class for Beginners taught by Salseros Dance Company Instructors. Class will begin at 9pm. The band will start at 10pm. All Ages are welcome! $12 cover. 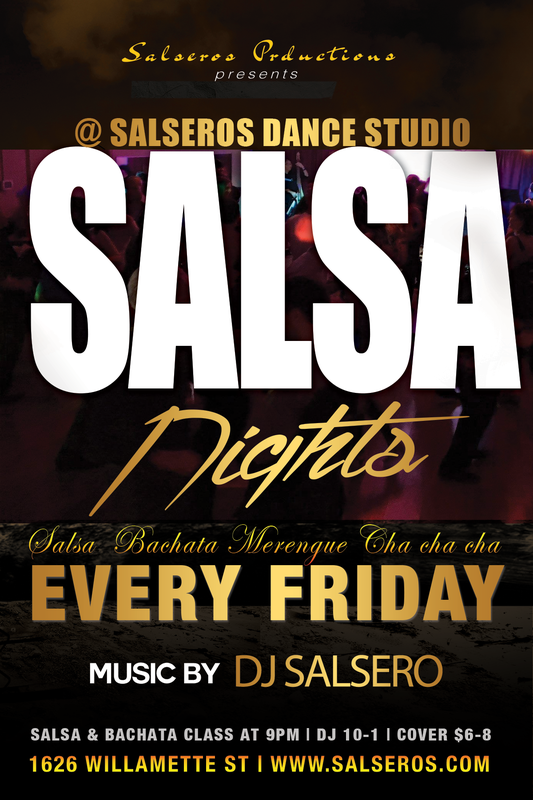 Join us this Friday for a great party at the Salseros Dance Studio. DJ Jose Cruz will be playing the hottest Salsa Music, plus Bachata, Merengue, & Cha cha cha. Salsa & Bachata Class for Beginners taught by Salseros Dance Company Instructors. No experience or partner is necessary to attend, All ages welcome. 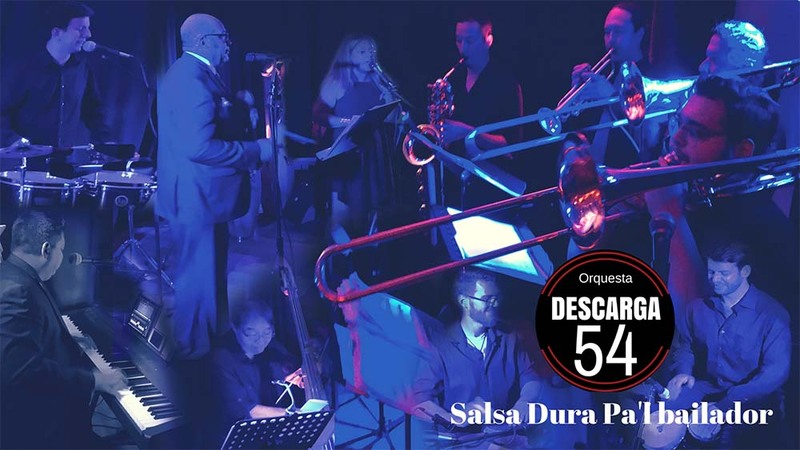 Join us for a Special Night with great Salsa Music plus Performances by Salseros Salsa Group, bachata Group and Salsa demo by students from the Salsa Training team. DJ Jose Cruz will be playing the hottest Salsa Music, plus Bachata, Merengue, & Cha cha cha. Salsa & Bachata Class for Beginners taught by Paula Tomczak Salseros Dance Company Instructor. No experience or partner is necessary to attend, All ages welcome.Doors open at 8:45pm, class begins at 9pm, and dancing all night starts at 10pm, performances at 11pm. $9 Cover, Only $7 Before 9:30pm. Salseros Dance Studio is located on the second floor of the Vet’s Club building at 1626 Willamette St.